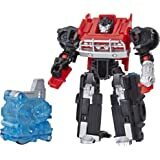 3.75-Inch shadow striker figure: 3.75-Inch Scout class shadow striker action attackers figure inspired by the cyberverse animated series. 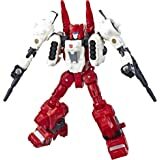 Similar figure scale to Legion class Transformers action figures. 2-In-1 toy: easy Conversion kids ages 6 and up can do! 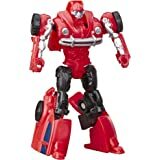 Easily convert shadow striker toy from robot to car mode in 6 steps. Makes a great gift. Signature shadow striker attack move: convert the evil deception shadow striker to activate stealth sniper shot action attack move. Fun attack move can be repeated through easy reactivation steps. 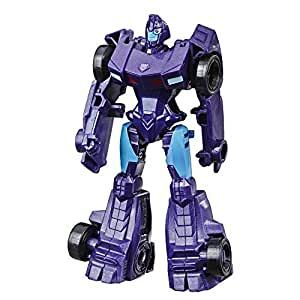 Classic cyberverse character: purple and blue robot with signature red eye designed to look like the vengeful Warrior from the cyberverse cartoon. 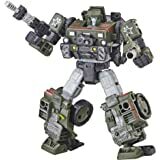 Tv-show-inspired: Transformers Robots are giant battling bots from the Planet Cyber Tron. The Autobots and Deceptions traveled from Cyber Tron on their spaceships, the ARK and the nemesis, in pursuit of the powerful all spark. 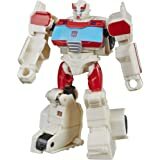 Each Transformers robot has 2 modes. They Convert from Robots to vehicles such as cars, trucks, Jets, and tanks! Each Bot has a special ability known as an action attack move; these signature attack moves activate in battle! 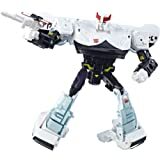 In season One of the cyberverse television series, wind blade helps Bumblebee connect to the hivemind to recover his lost memories. 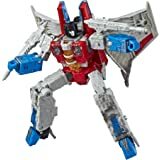 Transformers Toys Generations War for Cybertron Voyager Wfc-S24 Starscream Action Figure - Siege Chapter - Adults & Kids Ages 8 & Up, 7"
"Picture This: Me, on earth, still cooler than everyone This side of Optimus Prime, but I've got zero memories. Now I'm on a mission to recover My memories and discover all of my awesome powers. 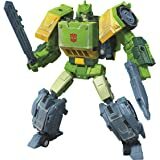 I'll have to battle Deceptions, outrun an explosion or two, and be heroic- basically, I'm in for one epic ride across the cybernetic." 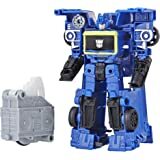 easily convert and attack with Transformers cyberverse action attackers toys! Simply convert shadow striker from robot to vehicle mode in 6 steps. The last step of conversion activates shadow striker figure's stealth sniper shot action attack move! Once converted, move can be repeated through easy reactivation steps. 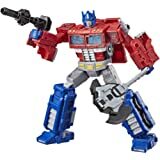 kids can collect other action attackers figures, each sold separately, to discover the signature attack moves of favorite characters from the cybernetic series -- one of the best ways to introduce young kids and new fans to the exciting world of Transformers!